My youngest daughter just turned 7. And we wanted to make her something special for her birthday. So I grabbed some supplies and we headed to my parents. We were going there so my hubby could move trees and I needed to get these done for the party. ;-) Luckily I had my moms help to make them. If you want to check out her blog, visit HERE! You'll love it! Anyway...they turned out so cute! Don't you think?!? First, set your oven to 350º. Then, start by mixing up your cake mix. We used Vanilla. I took the birthday girl down the cake isle and said pick your cake. Her eyes lit up when she saw one box had two box tops on it. Not one. (Her school is collecting them this year) She picked that box just because of the two box tops. CUTE! It happened to be one of her favorites. Plain White Cake. Once the cake mix was done, the kids added sprinkles. They wanted to make it confetti cake. Once your cake mix is all set, you'll want to scoop it into the ice cream cones. You want to fill them about 1/4 of the way full. Just enough for the cakes to puff over the top of the cone. Take your foil and cup them around the base of the cone and place into the cupcake pan. The foil helps keep the cones standing up while baking and also keep the cones from scorching. Place in oven and cook at 350º for 8-12 minutes. More if needed. We used a convection oven, so they cooked nice and fast. Look at how great these look. Now it's time to melt down those Vanilla Candies. We chose pink of course. After your cakes are completely cool, dip the bottom of the cones in the vanilla candy. Turn over and place in the cup cake pans to harden. It won't take too long. While those set, you can make your frosting. Cream together the butter, vanilla, milk and salt. Slowly mix in the sifted powdered sugar. Add more or less milk as needed. If you end up adding too much milk, you can always mix in more powdered sugar. We added in Violet Wilton Food Coloring for our Princess! Your cakes should be ready for frosting. You can just spread it on with a knife or pipe it on like I did. Place them back in the foil cup cake pans for travel, if you're taking them somewhere. I had some left over batter and one of my kiddos doesn't like cones, so I made cupcakes. We used a apple corer to hollow out the centers of the cupcakes. I added some of the vanilla candy to the center. A little candy surprise inside. Pipe on some frosting and these are ready to serve too! And finally, here's my cute birthday girl enjoying the beater of frosting. Let me know if you make them! I'd love to see what you come up with for yours! 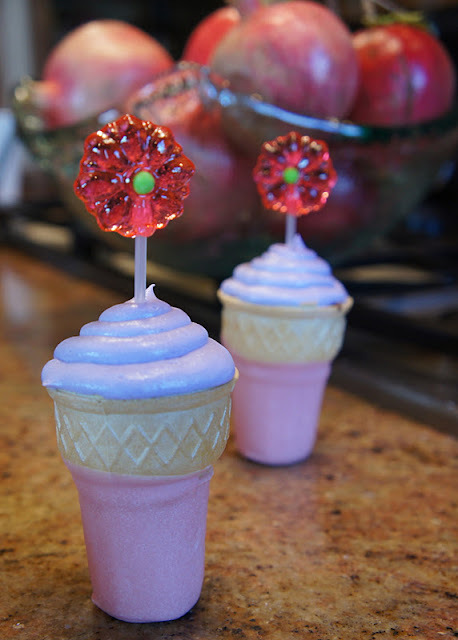 Super cute cupcakes/icecream cone idea! I love it! You are so creative, Tara. You pretty much rule! Those look amazing. I love your simple explanation too. Oh yum! So cute, and I bet the kids loved them! I like the cone cakes, great idea! My mom made me cone cakes for my 4th birthday. Great memories! These look awesome.